It's bad enough that many are still not convinced to use sunblock on a regular basis. "It's cloudy today; I don't need to." "I don't need it because I have no wrinkles." Now there's another excuse, albeit no less lame, for leaving the sunblock at home. For some time now, the Environmental Working Group (a charity I support) has sponsored and produced a website that does some work that the FDA doesn't: reporting on the ingredients in cosmetic products. 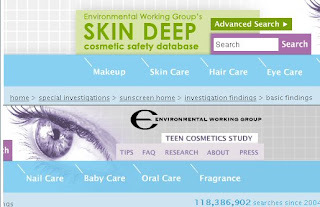 At the EWG Cosmetic Safety Database, found at cosmeticsdatabase.com, visitors can learn about ingredients and study recommendations. In 2008, EWG sponsored a summary of sunblock products, in which they pointed out that in addition to products that don't protect against the sun (many because they don't provide UVA protection or quickly break down in the sun), some products contain potentially hazardous incredients. For example, the EWG investigation lists among their concerns oxybenzone (benzophenone-3) and homosalate. The EWG's website includes a separate page for each ingredient, permitting readers to form their own opinions about risk / efficacy tradeoffs. A 2009 version of the report is in preparation; sign up on the site for notifications.